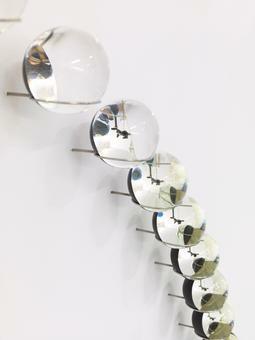 Dong Zhuang sunpath comprises thirty-nine partly mirrored glass spheres, resting on stainless steel hangers attached to a wall. 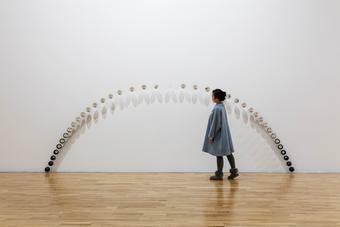 With the floor signalling the horizon, the sequence of spheres form a curve on the wall, tracing the path of the sun in the Guangzhou area on 22 September 2012, the date of the autumnal equinox, where the axis of the earth is neither titled towards nor away from the sun, and day and night are of (almost) equal length. 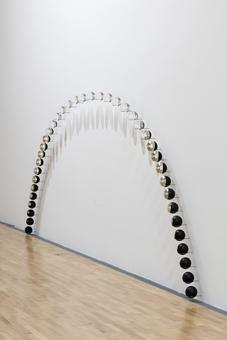 The spheres are placed in gradually increasing intervals towards the highest point of the curve. Measurements were taken at intervals of approximately nineteen minutes over the course of twelve hours. Partially mirrored on the inside and coated black on their exterior, the spheres make reference to the sun’s trajectory on yet another level: representing the moment before sunrise with a fully coated sphere, gradually decreasing in mirrored surface to an entirely clear sphere representing the sun in zenith at noon. 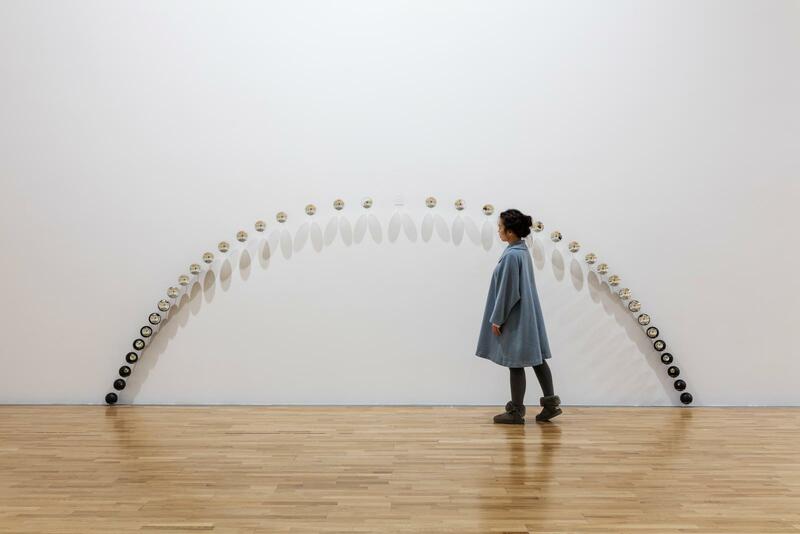 Looking into the mirrored spheres, the viewer is confronted not only with his or her own reflection, but also a reflection of the surrounding space. 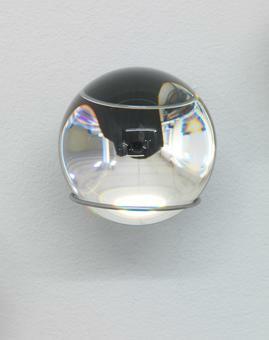 While seeing only a fragmentary spatial reflection in glass spheres with merely a small silvered surface, an almost complete reflection of the space is seen in a semiglazed ball. 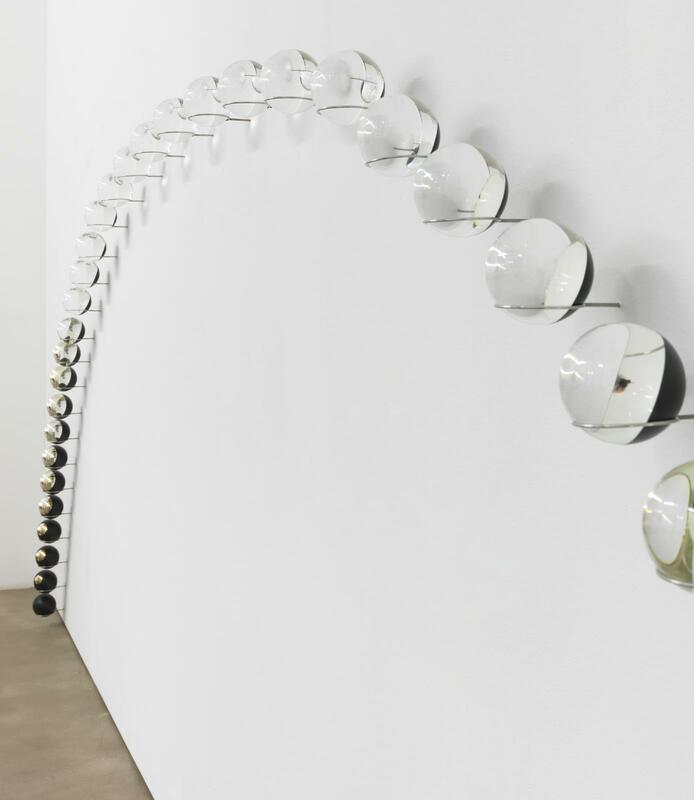 Spheres that are almost entirely coated significantly restrict the reflection of the surrounding space – revealing the limits of visual perception. Dong Zhuang sunpath is part of Eliasson’s ongoing investigations of the sun’s trajectory in space as experienced from particular locations on earth; this site-specificity highlights the sunpath as a perceived reality as much as a scientific phenomenon. 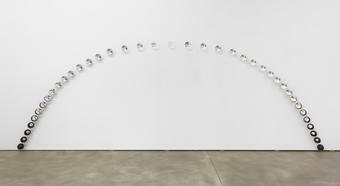 The correlation of place, body, and the universe is often inscribed into Eliasson’s installations. Among his previous studies are the Dagslyspavillon (daylight pavilion), 2007, in Hørsholm, Denmark, and the Sunspace for Shibukawa, 2009, in Japan – three-dimensional spaces whose design has, in part, been informed by scientific observations.